For some of this year's classes, there will be brief revision notes available. So now you'll have no excuse for not remembering what you learned the previous week. They are not a substitute for attending classes, though, as they may make little sense if you haven't seen and tried the steps yourself. However, armed with the names of the figures, you can then look them up on YouTube etc. 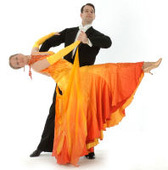 There is quite a lot of ballroom music out there but you will want to be looking out for stuff which is "strict tempo" - ie the music is at the correct speed for the named dance throughout. Beginners may do best with the deliberately simple-to-follow beats of Ross Mitchell recordings while advanced dancers tend to favour the less "boring" options. Eg check out the range at WRD Music or Casa Musica or DSI London or Dancelife. Cheap compilations of really old tracks (eg featuring Victor Silvester, Joe Loss or Cyril Stapleton) are unlikely to appeal to a young, modern audience. See also: a list of things you may have heard us play at General Dancing on our compilation CDs.